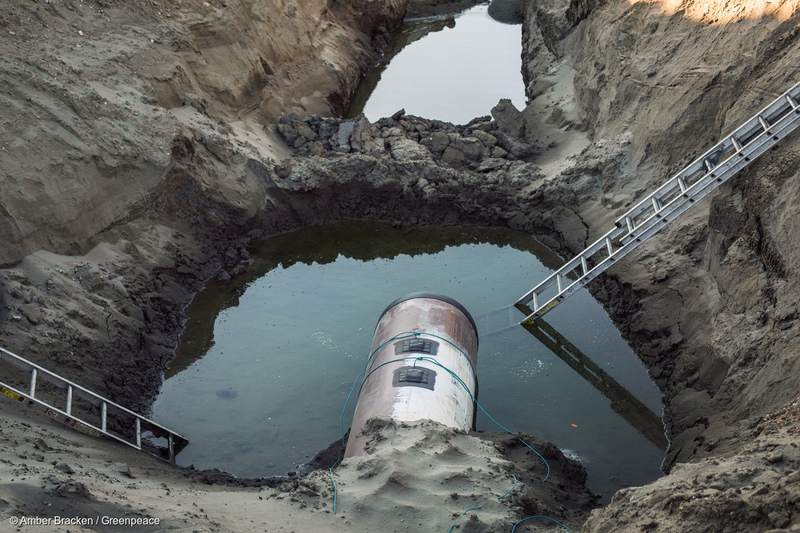 New Greenpeace report shows newly installed pipelines are not free from dangerous incidents. Canada’s tar sands sector has had a rough couple of years. 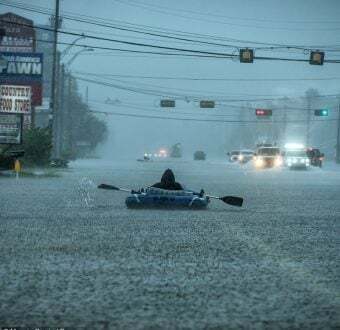 The highly destructive and carbon-intensive oil fields have had a hard time getting their product to overseas markets. The existing pipeline network is running at full capacity, and as a result, tar sands companies have been feeling the pain. Western Canadian crude has been trading at a steep discount compared to other crude oils and many new projects have been put on hold. To allow for expansion, five pipeline projects were proposed to carry tar sands to refineries or export terminals. But one by one, those proposals have run into a buzzsaw of grassroots opposition, led by First Nations and Indigenous groups along the proposed routes. The Northern Gateway and Energy East pipelines have already got the axe. Earlier this year, Canadian Prime Minister Justin Trudeau purchased the troubled Trans Mountain Expansion from Texas-based Kinder Morgan only to have the project delayed by the courts for not properly consulting with First Nations and not fully considering impacts to endangered orcas. And just last week, a federal judge blocked Trump’s approval of the Keystone XL pipeline for lack of an adequate environmental review. As a result, both Trans Mountain and Keystone XL must go back to the drawing board. This leaves only one tar sands pipeline currently moving ahead – Enbridge’s proposed Line 3 Expansion. Enbridge’s Line 3 expansion under construction near Hardisty, Alberta. 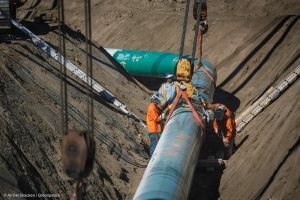 The Canadian company, Enbridge, is proposing to replace and expand its aging Line 3 pipeline which would follow a new route across Minnesota. Indigenous people, activists, and everyday Minnesotans have mobilized to oppose the project and to contest the regulatory process Enbridge needs to begin construction. Unfortunately, the Minnesota Public Utilities Commission has approved Enbridge’s plan, although there are still numerous permits that Enbridge needs before it can start construction. Governor Mark Dayton must step in to stop this dangerous pipeline before it starts. Acknowledging the known integrity risks with the existing pipeline, Enbridge argued the way to reduce the risk of a spill is to replace the dangerous old Line 3 with yet another pipeline. A new Greenpeace USA report “Dangerous Pipelines: Enbridge’s History of Spills Threatens Minnesota Waters” shows that newly installed pipelines are not free from dangerous incidents. The report found that from 2002 to 2018, Enbridge (and its joint ventures and subsidiaries) averaged one pipeline incident every 20 days, and 46 Enbridge spills were due to equipment or materials installed 10 years or less prior to the incident. Enbridge’s pipeline incidents are due both to recently installed equipment, as well as older legacy equipment. There is no safe method for transporting oil. Pipelines inevitably spill, its not a matter of if but when it will happen. And when they do spill it’s the communities along their routes that suffer. 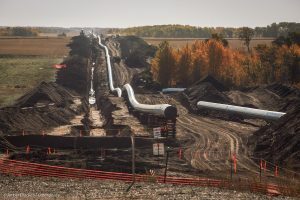 Enbridge’s Line 3 expansion under construction near Hardisty, Alberta. Enbridge is proposing to replace and expand its aging Line 3 pipeline which would follow a new route across Minnesota. Communities in Minnesota and in the surrounding region have experienced Enbridge oil spills some of which impacted hundreds of families, polluted waterways, and cost billions to clean up. In order to have a chance of limiting global warming to safe levels, the dirty, carbon intensive tar sands can’t be allowed to expand any further, which means that stopping all of these proposed tar sands pipelines is hugely important. The good news is that the strategy is working and the movement is winning. Governor Dayton must stop Enbridge from building the dangerous Line 3 expansion project that cuts through Indigenous treaty land, puts water and wildlife at risk of oil spills, and contributes to climate change. Dayton must show up for his community until his last day in office and leave a legacy that he can be proud of – one that protects people and the environment they depend on so the Governor-elect Walz can continue in a direction that puts people at the heart of policy and decision making and builds toward renewable energy future that is safe, fair, and just for all. Tim Donaghy is a Senior Research Specialist and Leola Abraham is the Global Communications Lead at Greenpeace USA.